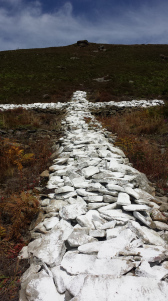 Unmissable on the mountainside above Trealaw is a striking white cross made of large stones painted white. 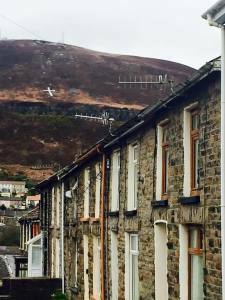 For the last 10 years it has captured the attention and imagination of visitors and residents alike in the Rhondda Fawr, all asking the same question: who put it there and why?! After baffling residents, it’s mysterious creator was revealed in the form of local man Glyn Thomas. Living below Trealaw mountain (therefore not actually being able to see the cross himself) he carefully constructed the cross in 2005. He built it as a resting place for his friends’ ashes who had expressed a desire for them to be scattered on the mountain. Perhaps Glyn was unaware of how much of a wonderful landmark it would become, or how much speculation there would be about it’s origin.